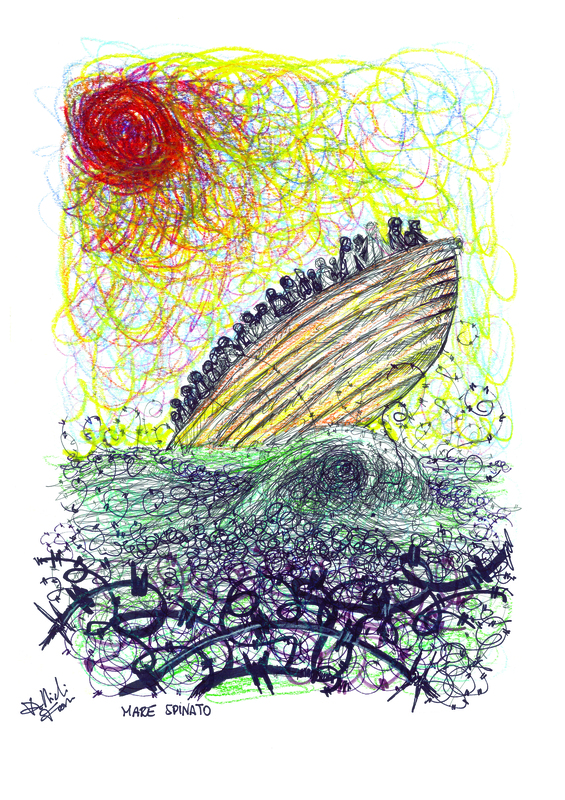 If I had not lived in Lampedusa, I would have never found the inner resilience to narrate these stories of migration through drawings. Moreover, at the age of 40-something, I would have never depicted the emotions making me able to describe these last four years spent on working along this European-Mediterranean border. I began making those drawings quite by accident, during the hot and sleepless nights when the dusty winds blowing across the sea from North Africa almost suffocate you. 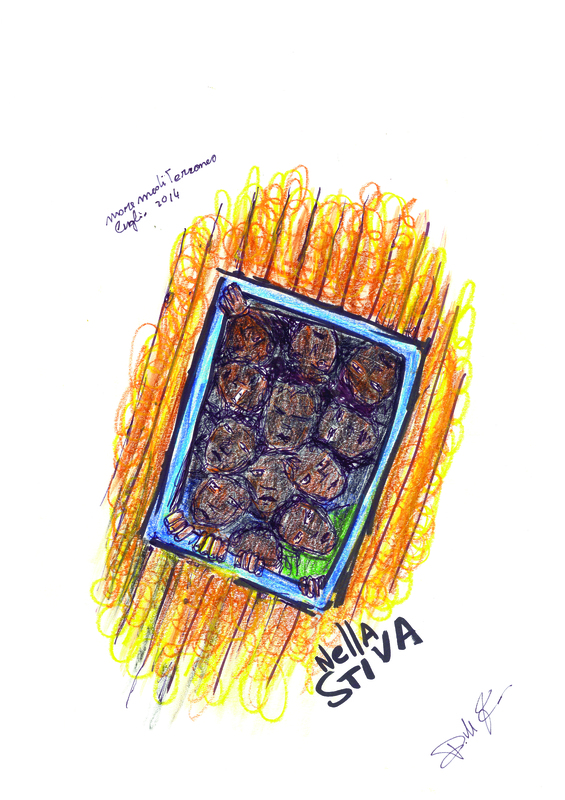 I have tried blending my colours scattered on a palette to give an account of what has been happening in Lampedusa. While I was drawing what I was seeing around me, I found a common thread in different meanings. I expressed something inside myself that was still to be settled. It was the need to address the feeling of being powerless: instead of being able to help, I could do nothing but counting dead people. In these drawings, I wanted to harness my anger and remember what made me angry. Drawing, to me, means a soul searching to narrate what is happening inside: a picture becomes a key to open the door of a tale that crosses the borders. 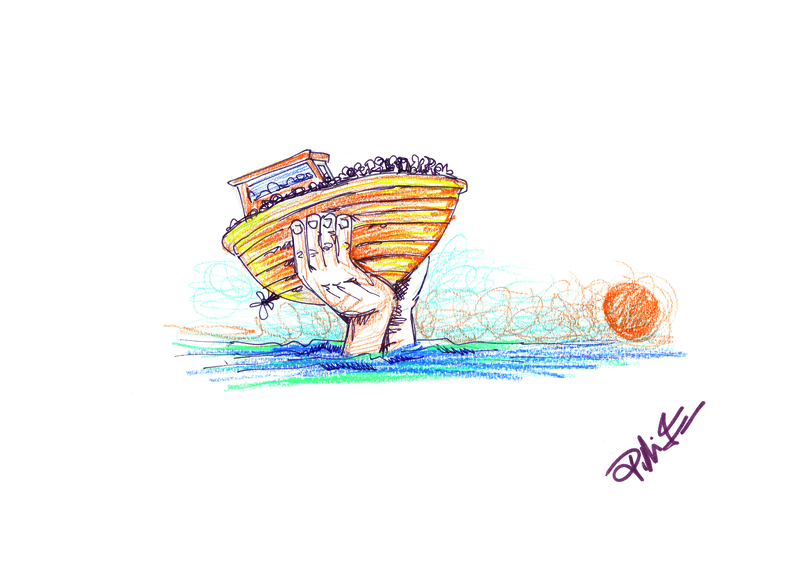 My drawings tell stories that otherwise would have been consigned to the oblivion of the sea. These stories fit perfectly together. They can be used like tarot cards to tell the story of humanity, to both predict the future and explain the present. There is something epic in what is happening today in the Mediterranean Sea, where death and rebirth are creating a founding myth for a new humanity. Ulysses and Ithaca; the mermaids’ song; Neptune and the Trojan War, Moses’ exodus and the passion of Christ are all coming back again. 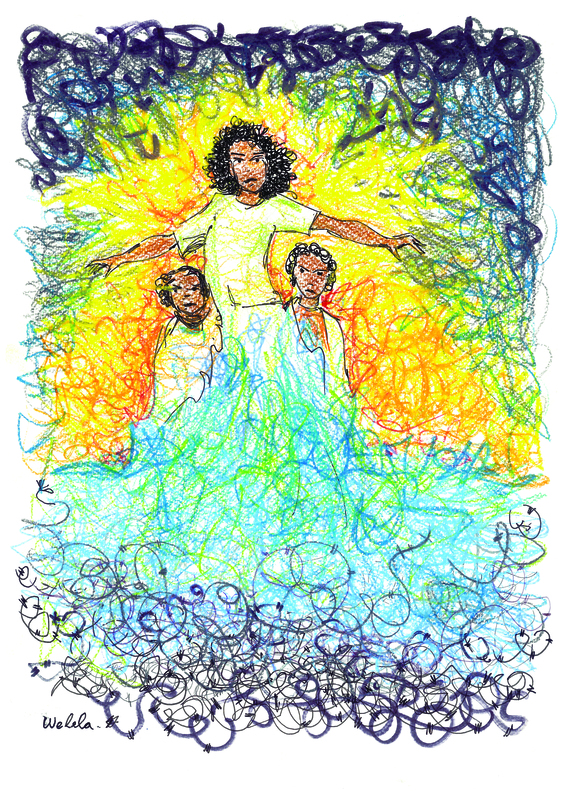 My works are essential and everything is drawn exactly just as it is. My drawings are completed in a matter of minutes, by means of hopeful vivid colours that are in contrast with the pain they recount. The colours, scrawled onto the page, swirl as in the vortex of a storm; they almost tear the paper on which they are drawn. My works depict the struggles of the wretched of the earth. 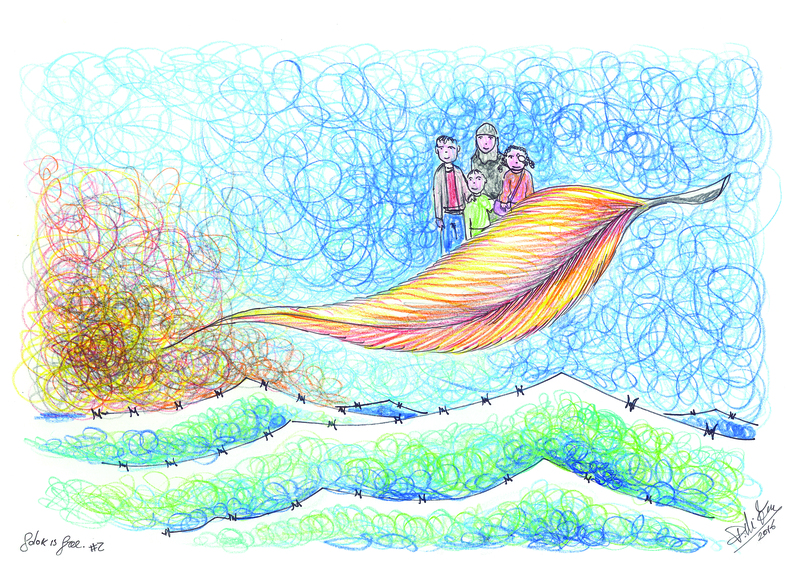 My illustrations depict the oppressive barriers that surround migrants: the barbed wire and the indifference. 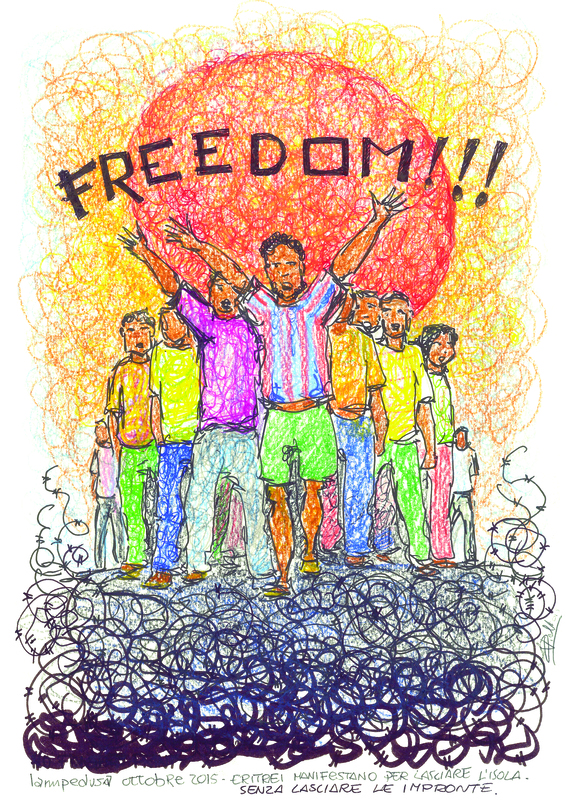 My drawings are an act of love for humanity – I would consider them emblems of justice and freedom. Mediterranean Hope (MH) – Refugees and Migrants Program was initiated by the Federation of Protestant Churches in Italy (FCEI) to strength the action and advocacy for the displaced and the asylum seekers. MH performs different actions: reception activities of the migrants and the menagement of the Observatory on the Mediterranean migrations in the island of Lampedusa. Furthermore, the MH House of Cultures in Scicli, (Ragusa, Sicily) takes care of unaccompanied minor migrants and vulnerable women while the relocation desk and a coordination desk in Rome, liaise with the national and international partners, the institutions and the ecumenical bodies. Among the actions implemented by MH, the Humanitarian Corridors managed with the Community of Sant’Egidio, aimed at opening safe and legal passages to vulnerable refugees from North Africa and Middle East. Francesco Piobbichi is a social designer and works as an operator of the MH project promoted by the FCEI. 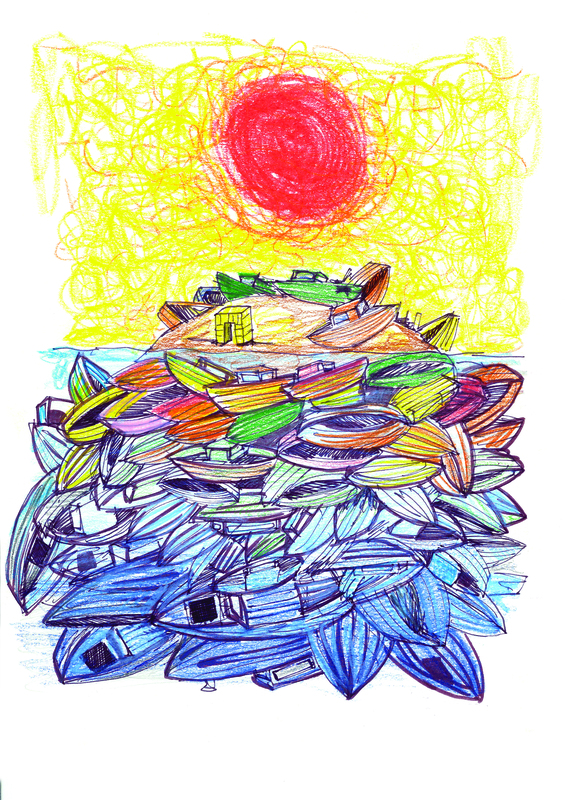 Drawings from the border is his first work narrating MH’s four years of activity in Lampedusa, Morocco and Lebanon during which Francesco Piobicchi has been involved in the development of humanitarian corridors. Mr. Piobicchi has always been committed to social rights and anti-racism, for this reason he uses illustrations as a communication tool to raise awareness on social issues.